Iraq's Prime Minister (PM) Haidar al-Abadi and Defense Minister Khalid al-Ubaidi came under increasing political pressure from former Prime Minister Nouri al-Maliki’s allies and select Shi'a militia leaders this week. Pro-Maliki social media levied criticisms in posts between April 24 and April 27, 2015. 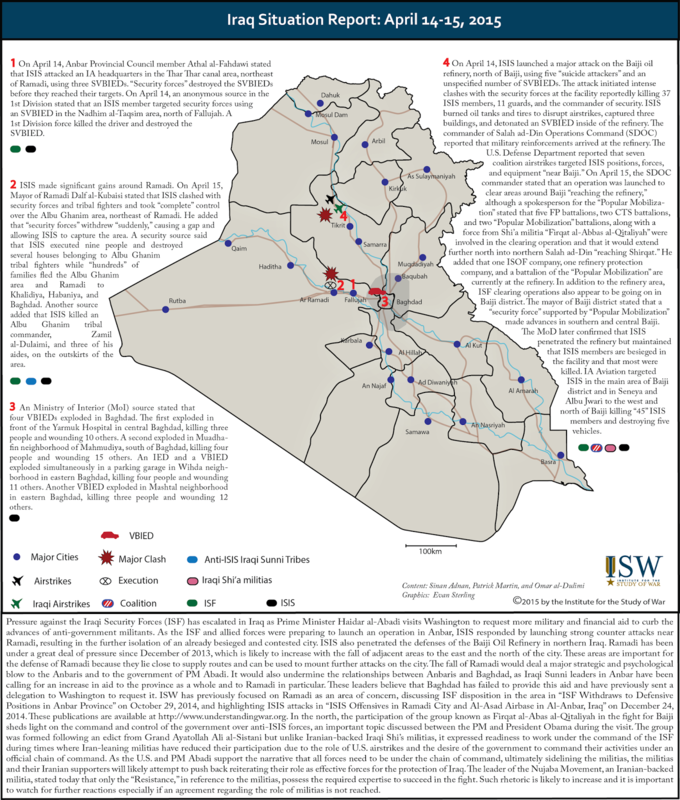 ISIS's successful attack against an Iraqi Army outpost in eastern Anbar provided the proximate cause for the criticism, allowing political opponents to target Abadi and Ubaidi for what they described as poor performance of the government in managing the security portfolio. 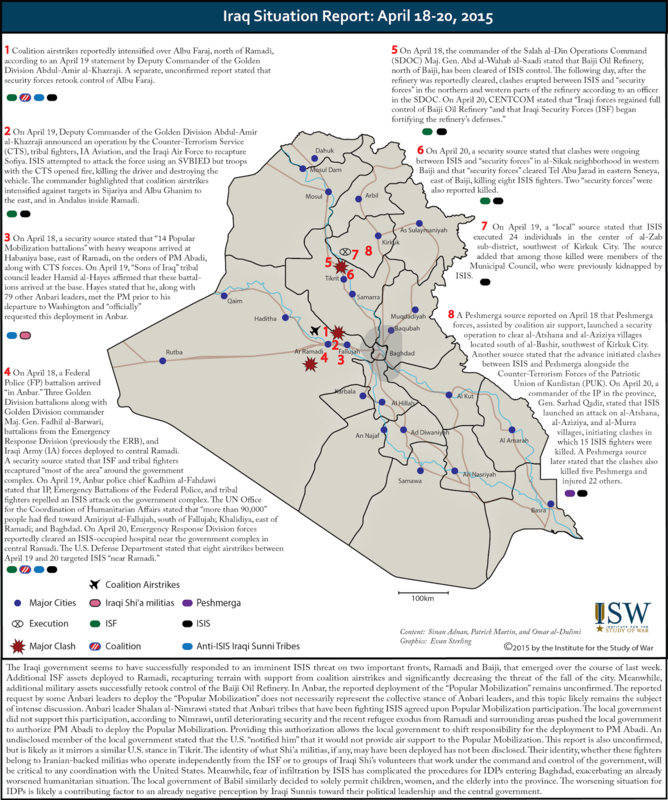 ISIS's recent gain in Anbar, while tactically important, is still relatively small given the overall success of the Iraqi Security Forces operation that cleared ISIS from Tikrit. It nevertheless showed that ground ISF units in Anbar are arrayed to address various high priorities such as the defense of Ramadi, preventing them from launching a successful ground rescue operation. 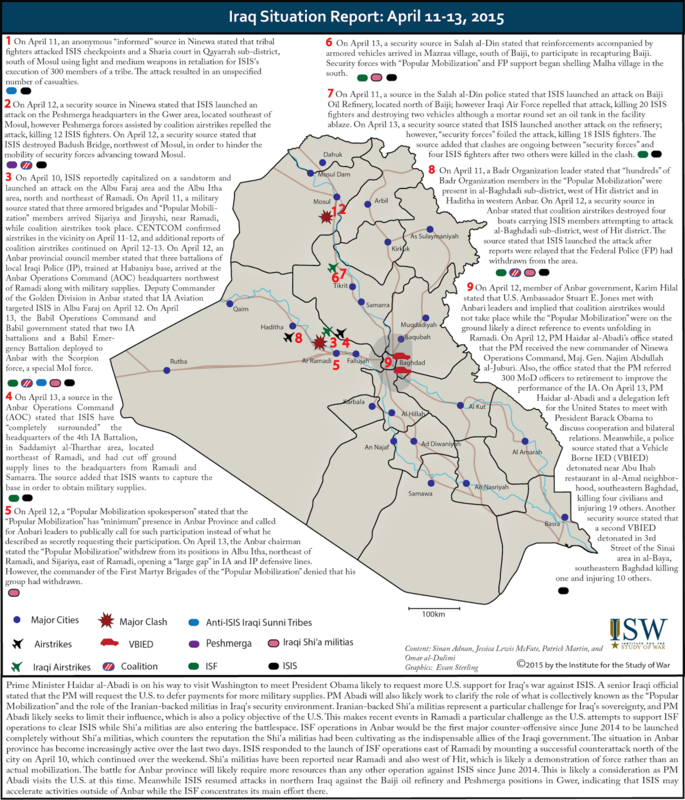 Shi'a political rivals are likely targeting Abadi not only to make political gains, but also because of his recent cooperation with the U.S., which angered politicians affiliated with Iranian-backed Iraqi Shi’a militias. Maliki has recently staged himself as a senior figure within the sphere of the militias by attending militia-sponsored events and funerals of senior militia figures. This outreach to the militias may indicate that he is setting conditions whereby he can break off militia-supportive elements of the Shi'a coalition that supports the current PM and challenge current Prime Minister Abadi, who is a member of his own Dawa party. 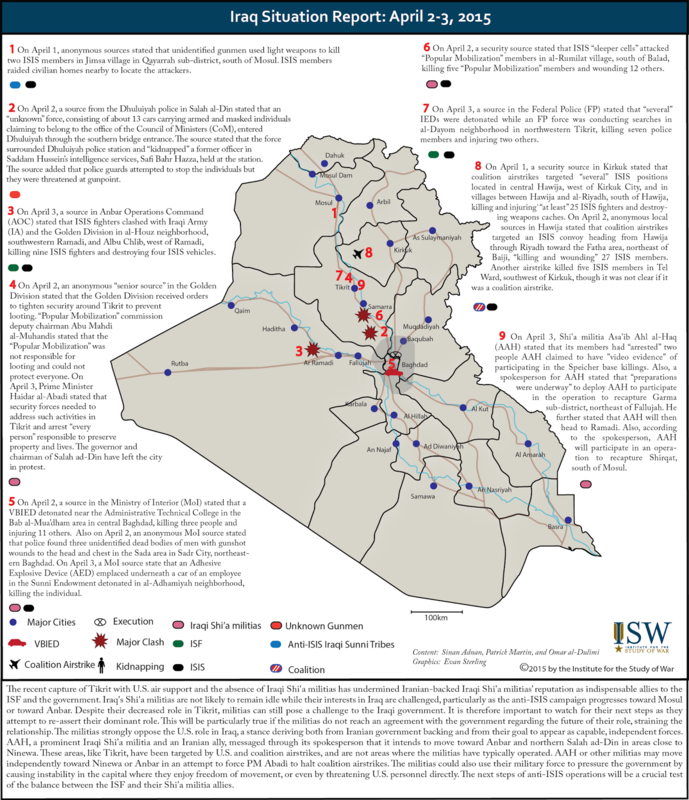 These events may increase political and social tension in Baghdad and Iraq’s Shi'a provinces at a vulnerable time. During last week, ISIS reportedly besieged an IA outpost near the Thar Thar regulatory Dam, an area in the desert between Baghdad and Anbar province with historic foot print of anti-government militant groups. 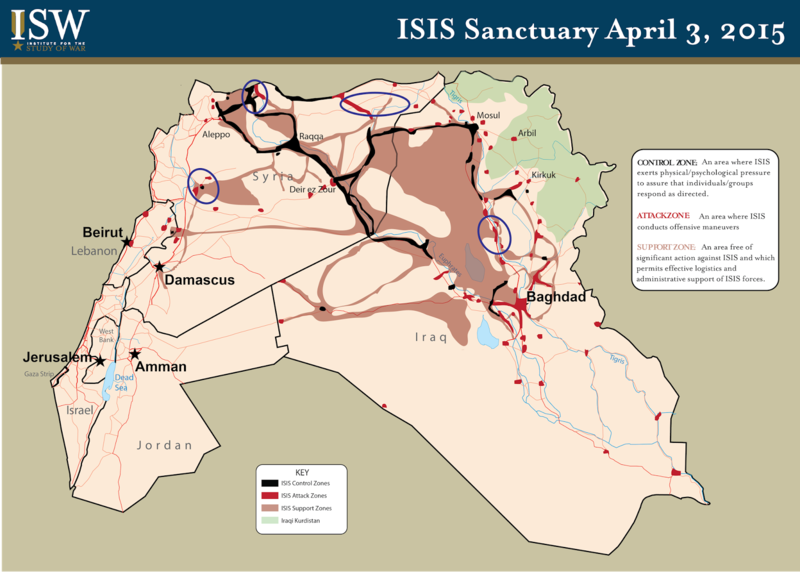 ISIS launched an attack on the base on April 24, 2015, initiating intense clashes with the ISF. The attack took place at a time when the ISF were advancing toward Garma, an area located northeast of Fallujah that is part of ISIS’s defense of Fallujah. The attack was likely meant to divert ISF resources in the area. Commander of the 1st IA division, which operates in eastern Anbar, Gen. Hassan Abas Tufan headed a force to reinforce the ISF at the outpost. ISIS then launched an attack on the force reportedly using four VBIEDs, killing the division commander along with the a Brigade commander. ISIS successfully expelled the IA forces from the outpost thereafter. The acting AOC commander stated on April 25, 2015 that forces from the IA and Federal Police (FP) deployed to the area with Iraqi and Coalition air support to roll back ISIS’s advance. 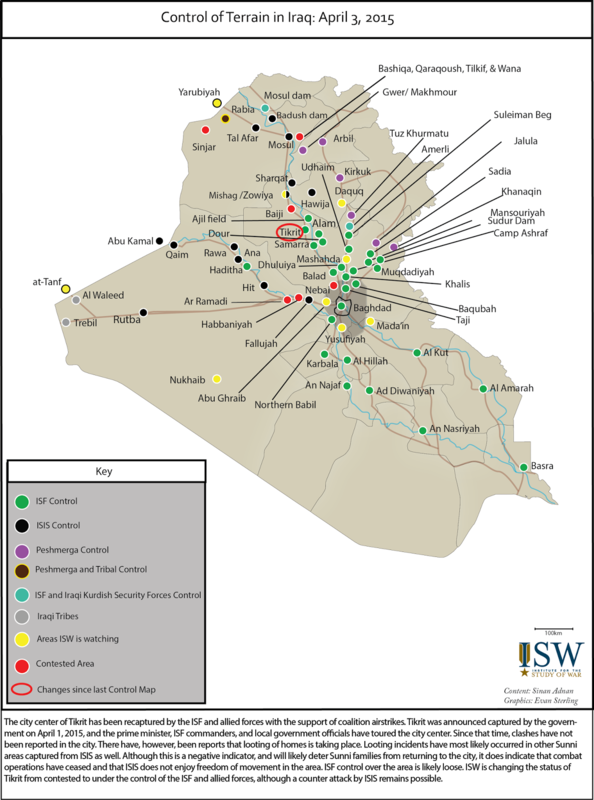 The Defense Minister stated on April 26, 2015 that ISIS remained in control of the regulatory dam, however, highlighting that the attack killed 13 individuals while seven others, who included members of the “Popular Mobilization” who fled the facility on April 25, 2015. Seven members were rescued on April 26, 2015 by an IA aviation force headed by the commander of the IA Aviation, Gen. Hamid al-Maliki. On April 27, Baghdad Operations Command (BOC) stated that it recaptured the regulatory dam. Official reports from the MoD and PM’s offices indicated that the casualty count from ISIS’s attack did not exceed 13 dead, but rumors circulated that the attack led to the death of more than a 100 ISF members. 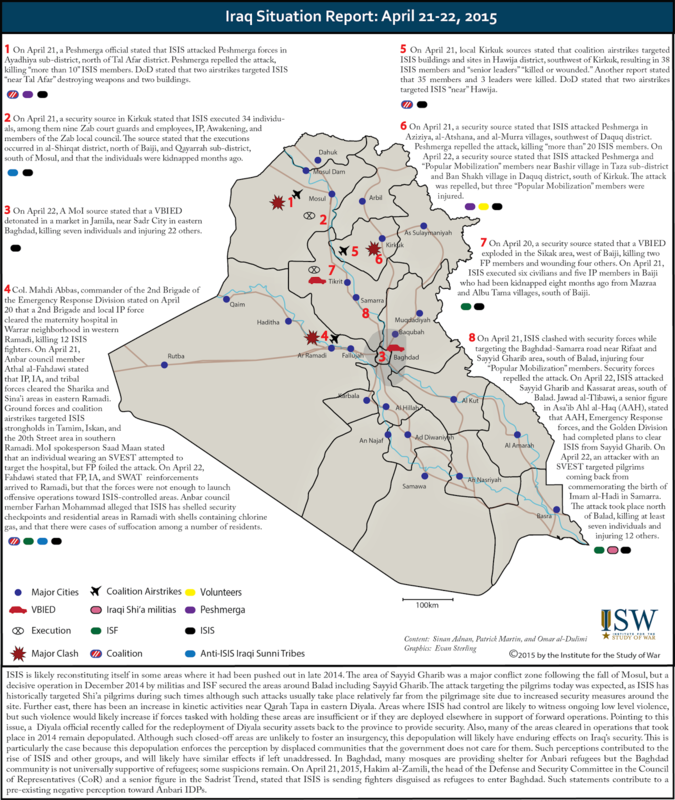 The inflated casualty count was broadcast by both ISIS supporters and political opponents of Abadi to attack his security record and that of the defense minister. ISIS published a video on April 25, 2015 showing the aftermath of the attack on what appeared to be a Company Headquarters (HQ) near the regulatory dam and two bodies dressed in ISF attire. The footage also showed ISIS members posting an ISIS flag in the base and roaming the premises. Separate anti-government social media outlets recycled pictures of other corpses, alleging that they were from the recent attack, further claiming that ISIS captured dozens of ISF members. In addition, some local news sources quoted a local official from Anbar stating that ISIS executed 50 ISF members in Fallujah that were kidnapped earlier from the regulatory dam. Then reports circulated through pro-ISIS social media and other questionable sources that 140 ISF members were besieged in the base and that ISIS opened the Thar Thar dam to flood Baghdad. ISIS is known to plant such rumors in order to shape battlefield reactions in its favor. One week prior, ISIS supporters spread rumors between April 11 and April 17 east of Ramadi before an assault, indicating that ISIS was advancing using a force much bigger than it actually possessed, causing residents and Iraqi Police (IP) forces in and around Ramadi to vacate their homes and positions in fear of an ISIS massacre. The criticism culminated on April 28, 2015 when the CoR hosted the defense mister. The session was also attended by the PM and other senior security leaders. The speaker of the CoR declared the session secret. Despite the secret nature of the session, it will almost certainly include a broader discussion beyond the events of Thar Thar. Political opponents, especially those affiliated with militias like Badr and allies of VP Maliki, will likely use the session to voice their discontent with the PM. This political escalation will likely have polarizing effects within the CoR in a way that can hinder the work of the government. Iraqi society has become neuralgic to events that result in the death of besieged ISF members especially after the killing of hundreds of ISF members that were besieged in Camp Speicher following the fall of Tikirt in June 2014. The reports of a massacre in Thar Thar resulted in public protests in Baghdad and Najaf that were likely genuine. It is also likely that Abadi opponents contributed to the organization of these protests, especially since the protest in Najaf called for the dismissal of the both, the PM and the defense minister. Iranian-backed militias themselves also have reason to undermine the PM at this time. 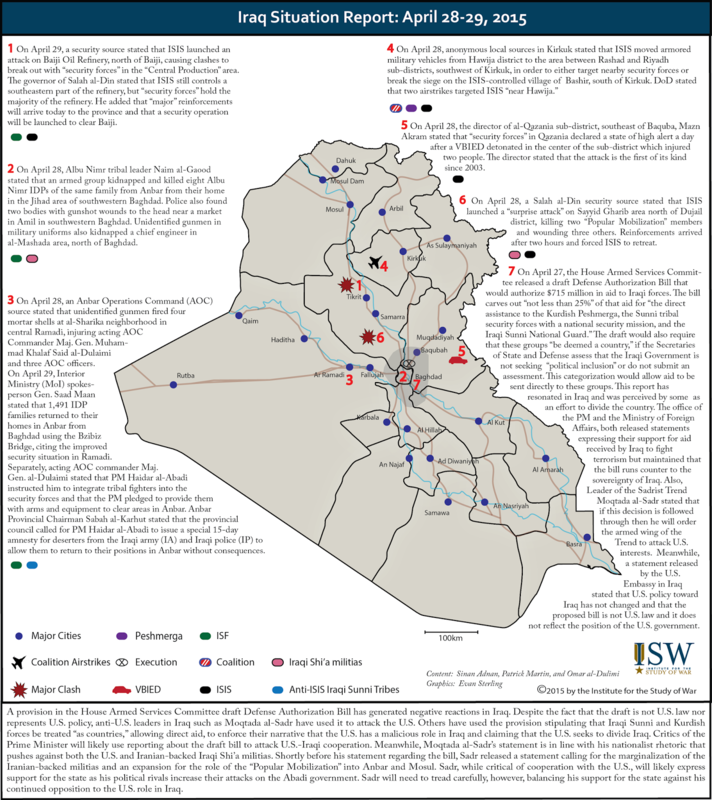 The recent coordination between Iraq and the U.S. that sidelined the Iranian backed-Iraqi Shi’a militias has generated a push back from Iranian allies in Iraq. Kata’ib Hezbollah (KH), a longstanding Iranian proxy group released four statements between April 21 and 27, 2015 attacking the Iraqi government and the PM for what it described as poor management of the security portfolio and heavy reliance on the U.S. KH distanced itself from what it described as agreements between the “head of authority and leaders in the Popular Mobilization” and indicated that it will withdraw from its fighting position near Baghdad and never participate in future operation as a demonstration against government policies. 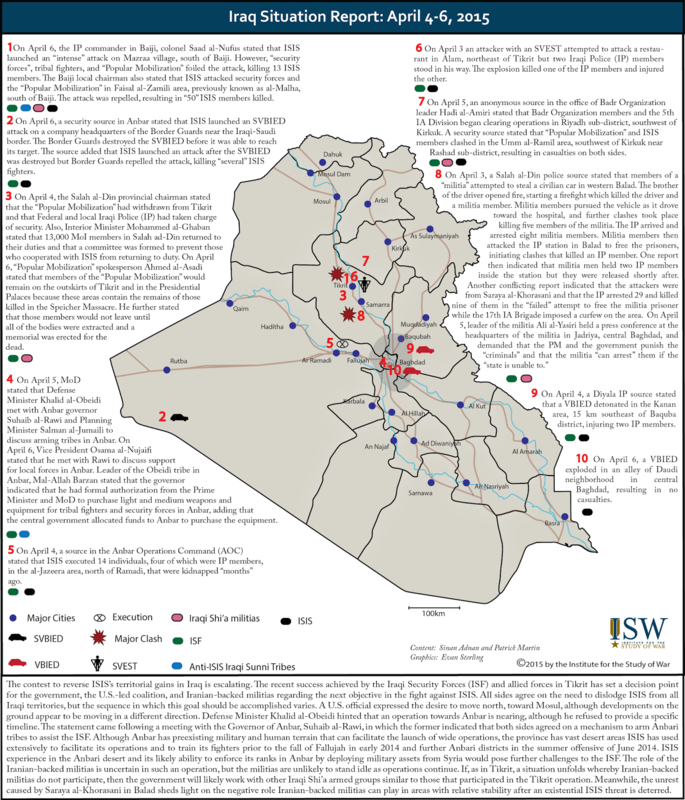 It is unlikely that this campaign to challenge PM Abadi will achieve substantial results such as the dismissal of the defense minister, but it does highlight that security is not the sole challenge for the Abadi government in April 2015. The recent effort by the PM to bring various militias including those backed by Iran under the control of the state has likely resulted in exacerbating tension between the PM and the militias. It has also given political rivals a direct opportunity to challenge him. The push back from KH provides insight into what to expect in the future if the government takes concrete efforts to take control of the militias. 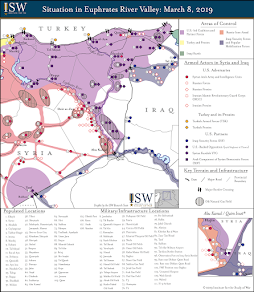 Primarily Islamist and jihadist rebelforces supported by al-Qaeda affiliate Jabhat al-Nusra (JN) seizedcontrolof the regime-held city of Jisr al-Shughour, southwest of Idlib City, on April 25, 2015. Jisr al-Shughour was a major regime stronghold in Idlib Province that many expected to present a difficult, hardened military target to anti-Assad forces. Reports prior to the fall of Idlib City to JN and rebel forces on March 28, 2015 indicated that the regime withdrew military assets to Jisr al-Shughour, possibly indicating regime intent to prioritize its defense over Idlib City. 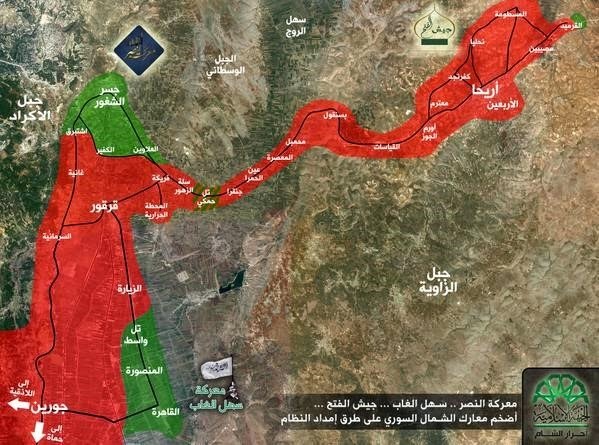 The fall of Jisr al-Shughour to JN and rebel forces is therefore a key indicator of the regime’s inability to defend terrain against increasingly coordinated anti-Assad forces without the assistance of Iranian proxies such as Hezbollah. 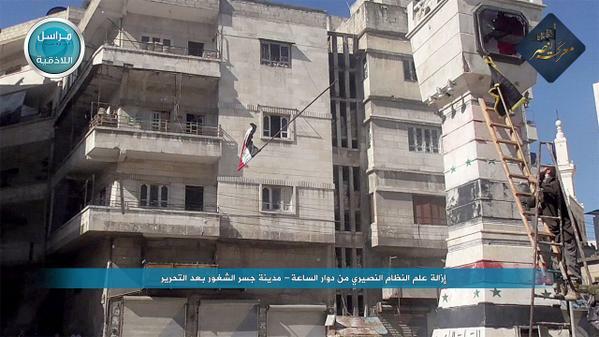 JN and rebel forces declared the “Battle of Victory” to seize Jisr al-Shughour on April 22, 2015. Anti-Assad forces made immediate gains following a JN VBIEDattack north of the city allowing JN and rebels to seize threeregime checkpointsand advanceinto the city’s urban terrain. JN and rebel forces exploited their initial penetration to seize wide segments of the city despite considerable regime aerial bombardment. Regime forces withdrew on April 25, allegedlyusing civilians as human shields to cover their withdrawal, and reportedlyexecuting23 detainees held at the Military Intelligence Branch before withdrawing. JN and HASIeach raised a flag in the central square of the city. The operation was commanded and controlled through a newly established operations room, which coordinatedthe involvement of JN, Ahrar al-Sham (HASI), Jaysh al-Islam, Ansar al-Sham, and the jihadist Jabhat Ansar al-Din coalition. The offensive also included participation from the primarily Chechen jihadist group Junud al-Sham in addition to the Turkistan Islamic Party in Syria. Two FSA-affiliated groups, the First Coastal Division and 13th Division, also participated, according to videos uploadedto YouTube of the groups firing TOW anti-tank missiles near the city. The coordination of this offensive through a joint operations room with large JN participation and likely leadership represents a second major success for JN in northern Syria. JN established a model for the command and control of joint offensives in the Jaysh al-Fatah operations room that seizedIdlib City on March 28. This victory likely incentivized rebel forces to buy into a JN-led operation at Jisr al-Shughour. JN cements its value to Syrian rebels and deepens its foothold in Syria by providing rebel forces with an effective vehicle for establishing unity of effort against the Assad regime, and by directly contributing to battlefield success. The increasingly Islamist and jihadist composition of rebel ranks in northern Syria, in part generated by JN’s action to sideline prominent moderate factions, furthermore strengthens JN’s position in northern Syria. The offensive to seize Jisr al-Shughour was one component of a larger campaign to seize control of the entirety of Idlib Province and to connect rebel systems in Idlib to rebel-held terrain in northern Hama Province. As JN and rebels consolidate in Jisr al-Shughour, two additional offensives are still ongoing. The first, undertaken by the Jaysh al-Fatah operations room, seeks to seize control of remaining regime strongholds south of Idlib City. A major Jaysh al-Fatah offensive is currently underwayagainst the Qarmeedand Mastoumamilitary camps, with likely intent to advance on the regime stronghold of Ariha next. Prior reports indicated that the regime deployedits elite “Tiger Forces” unit to reinforce this area, however the regime’s inability to resupply or further reinforce these positions after the fall of Jisr al-Shughour may enable JN and rebel success. Meanwhile, HASI, Ajnad al-Sham, and other rebel groups continue the “Battle to Free Sahel al-Ghab” to push north through the al-Gahb plain in an attempt to eliminate a regime-held “buffer zone” that separates rebel-held terrain in Hama and Idlib Provinces from the Alawite-majority province of Latakia. This offensive has made considerable gains, seizing numerous towns in the countryside south of Jisr al-Shughour. Together these three offensives are likely to provide sufficient momentum to JN and rebel forces to accomplish their objectives in Idlib Province, and will likely position anti-Assad forces for possible future operations to penetrate key regime terrain in the coastal Alawite heartland in Latakia Province. 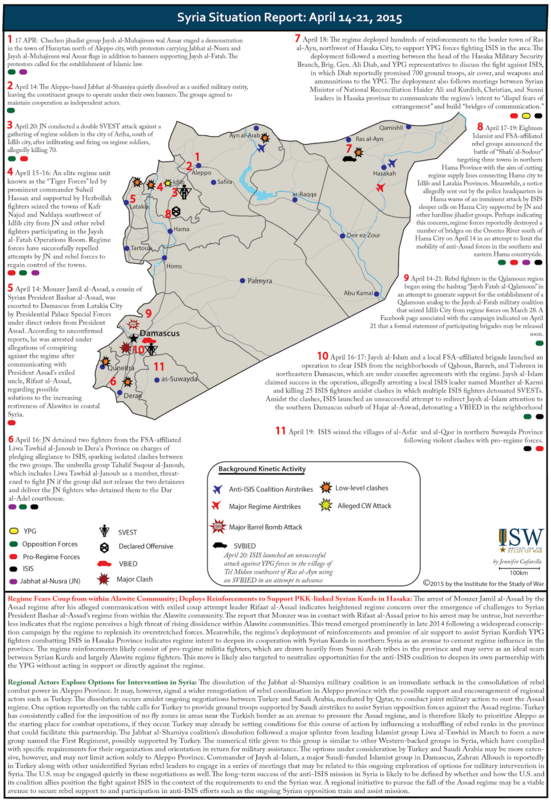 The ongoing JN and rebel gains in Idlib Province in 2015 have dealt a considerable blow to the Assad regime. They have furthermore demonstrated an increasing sophistication of rebel campaign design, likely enabled by JN’s deepening role. The Jaysh al-Fatah and Sahel al-Ghab operations facilitated the seizure of Jisr al-Shughour by limiting the regime’s ability to reinforce across fronts, while simultaneously pursuing linked objectives. Combined with the successes of rebel forces in southern Syria beginning in late 2014, the seizure of Idlib City and Jisr al-Shughour could indicate that the momentum of the war has turned against the Assad regime. A reinvigoration of rebel combat power has been provided in part by JN’s model for coordinating joint military operations, which has enabled anti-Assad forces to break the stalemate that has characterized Syrian front lines for over a year. Syrian rebels are unlikely to win the Syrian war even with increasing support from JN, but will likely continue to achieve tactical and operational successes. This could force the regime to make hard decisions about the terrain it is able and willing to defend, possibly leading to a contraction in the regime’s deployed military assets as JN and rebels exploit these successes. Alternately, regime commitment to its “army in all corners” strategy could sustain an overextension of Assad’s military power that will continue to provide vulnerable targets to JN and rebel forces outside of major urban centers. The regime’s response to the growing momentum of anti-Assad forces in northern Syria will therefore offer wider lessons regarding the likely trajectory of the Syrian war in 2015. ISIS lost control over central Tikrit following an offensive by the ISF and allied forces with the support of coalition airstrikes. 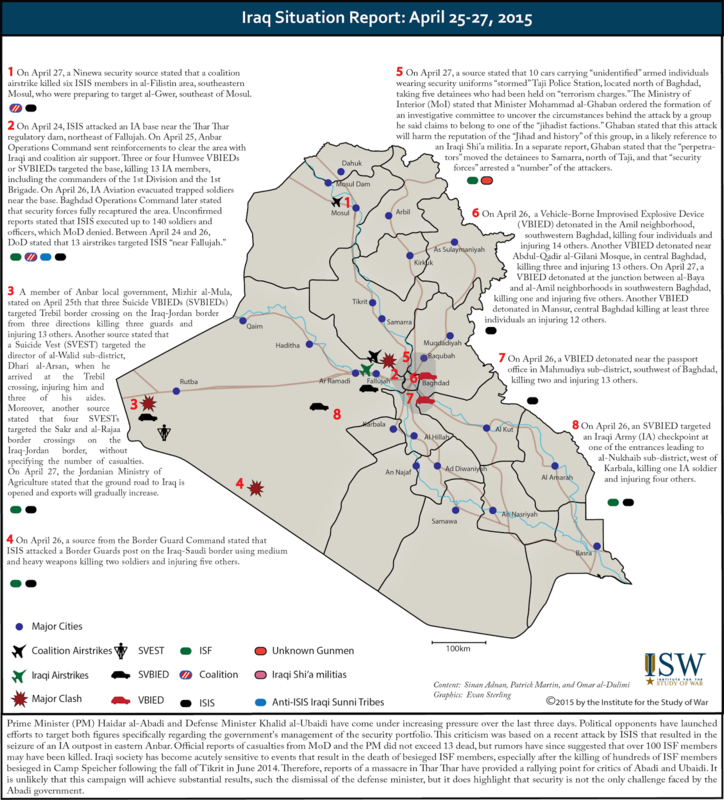 Tikrit was announced captured by the government on April 1, 2015, and PM Abadi, ISF commanders, and local government officials have toured the city center. 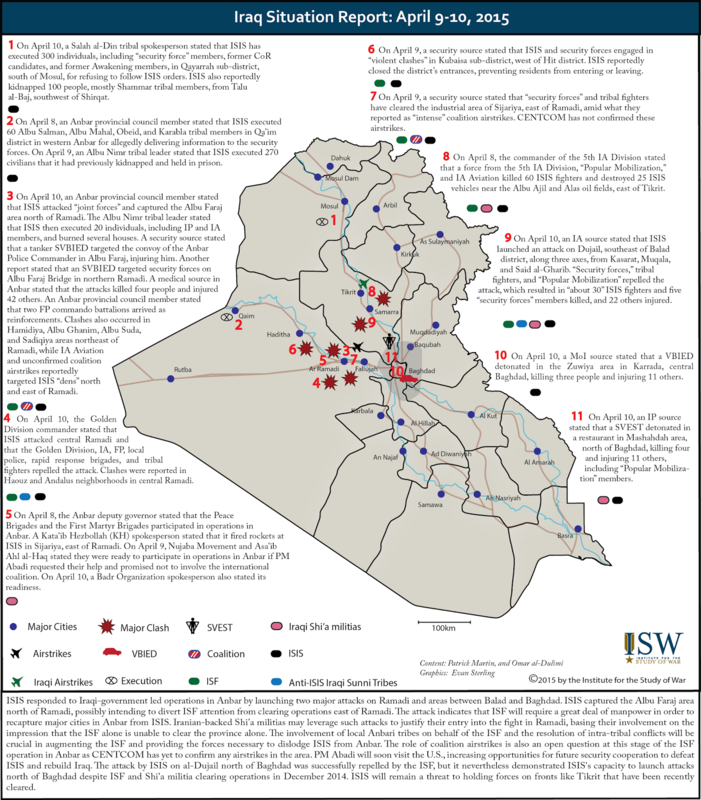 Since that time, clashes have not been reported in the city and reports that looting of homes is taking place further indicates that combat operations in Tikrit have ceased. 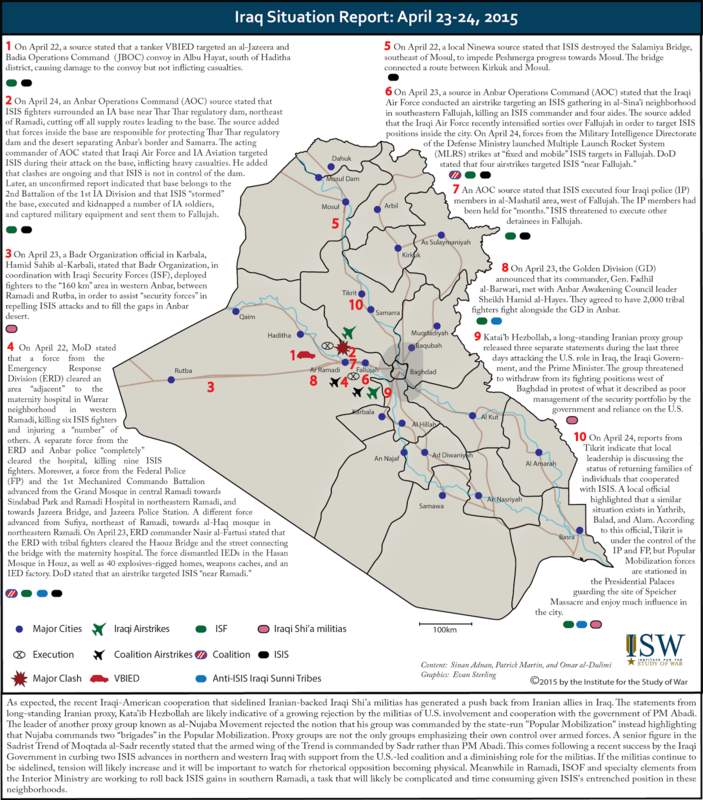 The areas immediately surrounding Tikrit likely remain an ISIS attack zone, however. 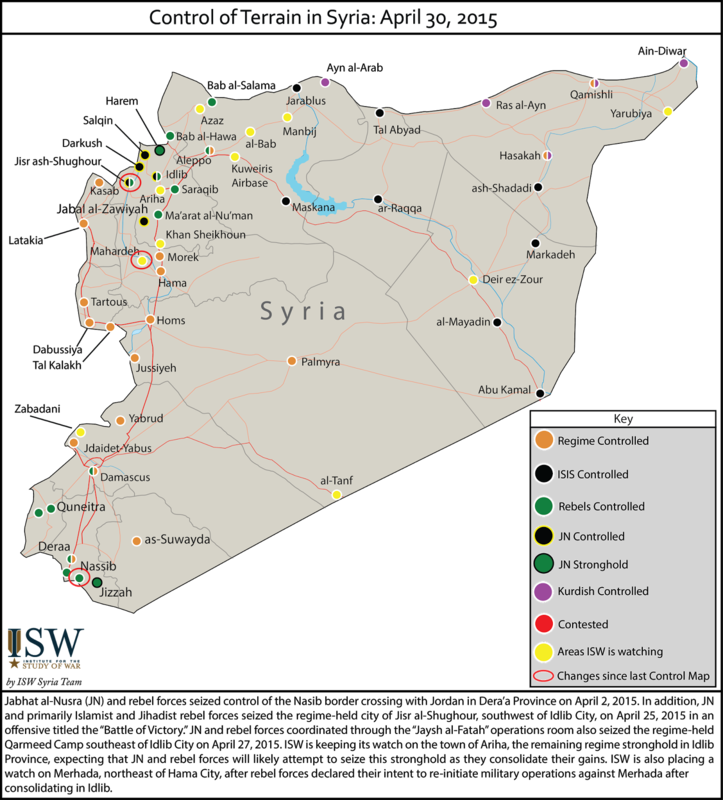 Meanwhile, ISIS intensified its military campaign in central and western Syria. Over the past month, ISIS launched a series of successful hit-and-run attacks against regime checkpoints, military facilities, and oil installations throughout eastern Homs and Hama Provinces, including several villages along the regime supply route to Aleppo city. ISIS counterbalanced these operations with consistent pressure along frontlines in Ayn al-Arab (Kobani) canton and Hasaka Province meant to dissuade further Kurdish advances into core ISIS terrain. ISIS also reasserted its presence in southern Damascus city, advancing into the Yarmouk Camp district after heavy clashes with rebel forces. The nature of these offensives suggests that ISIS seeks to shape conditions for future territorial gains in the Syrian central corridor while bolstering its narrative of victory following losses in northern Syria and Iraq. 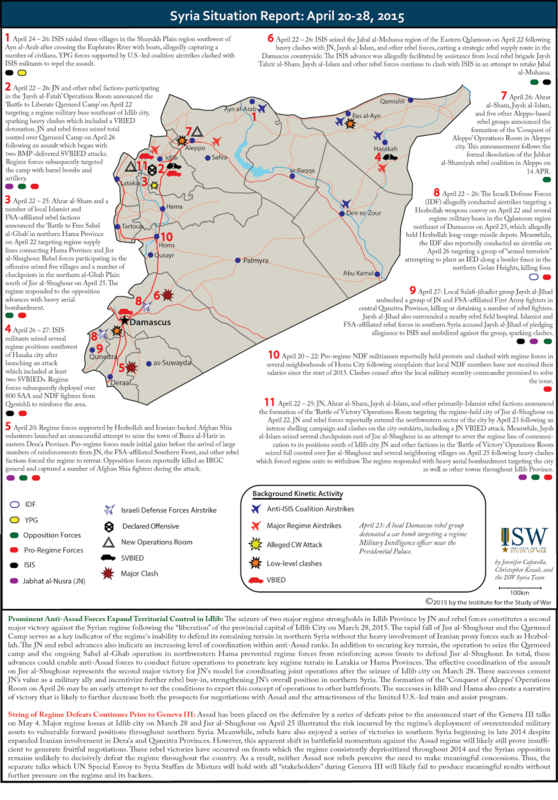 A series of ISIS defeats in Iraq and northern Syria over the past three months have driven ISIS to shift the focus of its Syrian campaign into central and western Syria in order to reestablish an image of military strength. ISIS was required to seek an alternate focus for its war effort in Syria due to its inability to defeat YPG forces in Aleppo and Hasaka Provinces. ISIS appears to have decided to target the Syrian regime rather than escalate directly against JN or Syrian rebel groups, and will likely continue capitalizing on disruptions in the regime’s military campaign in Idlib and Dera’a in order to maximize the effect of its own attacks in central Syria. ISIS may conduct a major attack against critical regime terrain such as the Palmyra Military Airbase or the regime and Hezbollah stronghold of Qusayr near the Lebanese border. If ISIS forces begin to display the ability to hold overrun regime positions in eastern Homs and Hama Provinces, this would be an indicator of a near-term ISIS offensive in the Syrian central corridor. 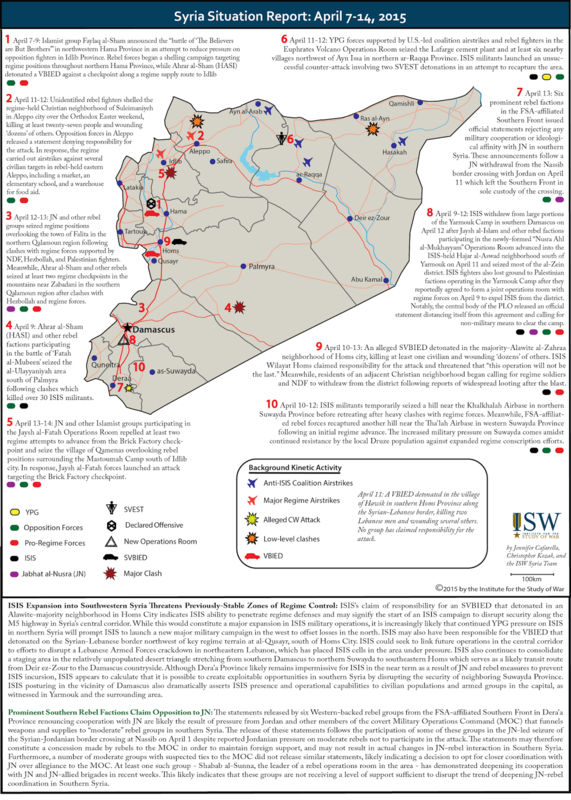 ISIS must balance its expanding activities in central and western Syria with the requirements of its ongoing defensive operations in northern and eastern Syria. ISIS escalation in central Syria may invite opportunistic or retributive counterattacks against ISIS forces in northern and eastern Syria by either YPG or Syrian regime forces. 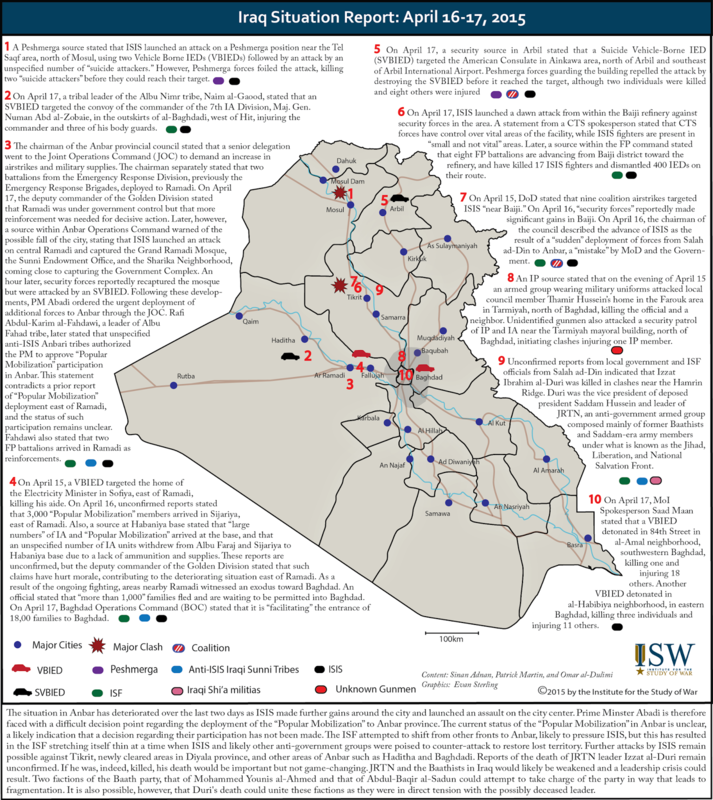 ISIS must maintain stable defensive lines in order to protect core ISIS interests in both Syria and Iraq. These include cross-border smuggling routes into Turkey, ground lines of communication connecting ISIS in Syria to ISIS in northern and western Iraq, and ultimately the de facto ISIS capital city of ar-Raqqa. ISIS appears to calculate that it is possible to maintain this defense by leveraging rebel defections to ISIS to offset the resource requirements of expansion into the central corridor. ISIS therefore prioritizes changing the calculus of rebel groups to favor ISIS expansion, and does so by disrupting the existing security environment. ISIS will likely also leverage its operations against the regime to curry favor with rebel groups, who may opt to facilitate increased ISIS activity in western Syria if directed against the Syrian regime. This expansion into western Syria will present a challenge to the anti-ISIS coalition, as it will likely to be unwilling to or unable to target ISIS positions inside core Syrian terrain. ISIS consolidated its defensive lines in eastern Aleppo Province following its retreat from Ayn al-Arab/Kobani in January 2015, as joint YPG-rebel forces operating under the Euphrates Volcano Operations Room and supported by U.S.-led anti-ISIS coalition airstrikes pushed southwest to challenge ISIS terrain along the Euphrates River. ISIS destroyed the Shuyukh Fawqaniand Qarah Qawqazbridges in mid-March after withdrawing to the western bank of the Euphrates River, ceding control of several villages to YPG-led forces in order to leverage the Euphrates as a natural barrier to YPG expansion. The slowdown of the Kurdish advance outwards from Ayn al-Arab/Kobani likely reflects Kurdish inability to project force deeper into the southern Ayn al-Arab countryside in order to challenge ISIS-held terrain along the M4 highway. It is also likely that the YPG do not seek to attack deep into the ISIS-held interior, where there is a minimal Kurdish population. ISIS is therefore likely to maintain its now-fortified positions on the western bank of the Euphrates River, and is unlikely to be challenged in its southeastern Aleppo or Raqqa terrain in the near term. ISIS has applied consistent offensive pressure against key YPG terrain along a frontline stretching from Ras al-Ayn on the Turkish border southeast through Tel Tamir and the Assyrian Christian villages of the Khabour Valley to Hasaka city. Taking advantage of the limited coalition air support provided to YPG forces in the province, ISIS launched an offensive against Ras al-Ayn on March 10, seizing Tel Khanzir and several other villages west and south of the town in clashes which included two separate Vehicle-Borne Improvised Explosive Device (VBIED) attacks. Meanwhile, ISIS militants continue to combat joint YPG-Assyrian forces in the western countryside of Tel Tamir following a late February ISIS offensive which seized most of the western bank of the Khabour River. Since March 20, ISIS also conducted three Suicide VBIED (SVBIED) and VBIED attacks against Kurdish neighborhoods of Hasaka city in an apparent attempt to weaken the resolve of Kurdish populations to continue their campaign against ISIS. Although ISIS has not managed to make major gains in these offensives, the constant pressure applied to western Hasaka Province is likely sufficient to prevent further YPG advances that could challenge ISIS-held terrain along the Turkish border west of Ras al-Ayn. ISIS has intensified internal security measures in eastern Deir ez-Zour Province in response to frequent attacks by unidentified militants against ISIS security patrols and checkpoints in the town of al-Mayadin in addition to persistent rumors of the establishment of anti-ISIS rebel sleeper cells in the region. ISIS continued its ongoing mass arrest campaign targeting former members of Jabhat al-Nusra and other rebel brigades. This campaign likely allows ISIS to address internal security fears through intimidation, to neutralize cells of potential resistance, and possibly to replenish depleted ISIS manpower reserves through conscription. Meanwhile, reports from March 27-28 indicated that ISIS fighters are reinforcing systems of interlocking trenches and berms around important ISIS urban terrain, suggesting that ISIS also fears an external challenge to its control over the Euphrates River Valley. ISIS first implemented this type of reinforcement in early January, digging a trench southwest of Abu Kamal, and has since expanded this fortification to almost fully encircle the border town in addition to constructing similar defenses surrounding al-Mayadin. ISIS likely perceives a continued threat from Deir ez-Zour tribes based in the eastern countryside of the province, who have previously resisted ISIS consolidation of power over the area. These fears may have been stoked in part by a regime raid against the ISIS-held T2 oil field west of Abu Kamal on March 4, which marked the first hostile incursion into eastern Deir ez-Zour Province since ISIS seized the area last year. 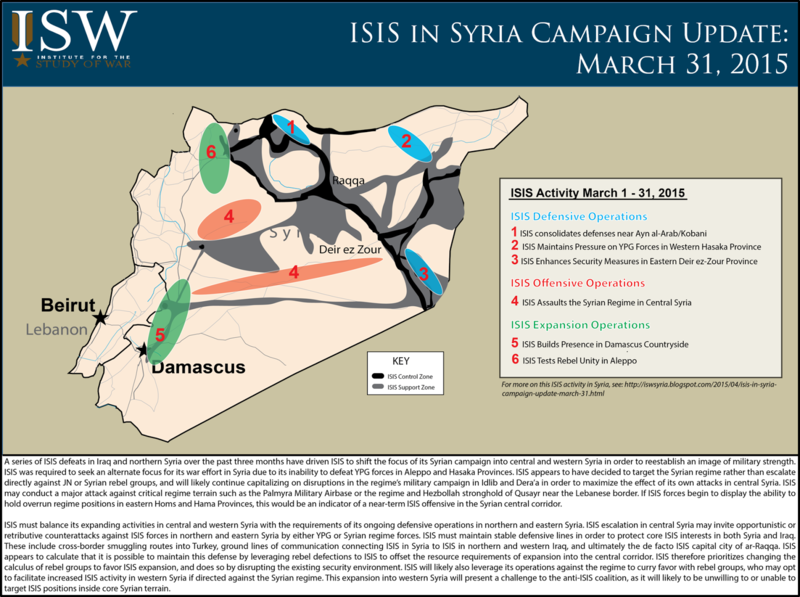 ISIS appears to have designated a new main effort against the Assad regime in central Syria beginning in early March 2015. Over the past month, ISIS forces launched a series of successful hit-and-run attacks against regime checkpoints, military facilities, and oilinstallations throughout eastern Homs and Hama Provinces including recent assaults against an air defense battalion near the Tiyas (T4) Airbase east of Homs City on March 27 and the regime-held village of Mabouja east of Hama City on March 31. The nature of these offensives suggests that ISIS seeks to shape the conditions for future territorial gains in central and western Syria while bolstering ISIS morale with a new narrative of victory. ISIS has conducted executions of alleged regime collaborators, massacres of Alawite civilians, and publicized beheadings of regime fighters in an effort to establish a perception of dominance over the Syrian regime and likely to maximize the asymmetric effect of ISIS attacks through psychological warfare. 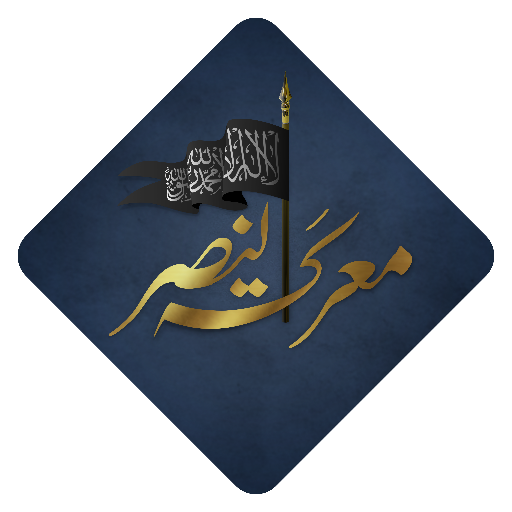 Increasing the visibility of this campaign, ISIS reestablished its “Wilayat” [Province] in Hama Province on March 29, releasing a video branded with the Wilayat Hama logo after over a year of silence. The reestablishment of the ISIS Hama media office underscores the propaganda value that ISIS seeks to derive from its operations against the regime in this region, and may signal ISIS intent to formalize its governance activities in the area. However, ISIS forces in Homs and Hama Provinces do not appear able to conduct sustained operations or hold recently-seized terrain. Multiple reports of ISIS withdrawals following heavy regime aerial bombardment suggest that ISIS units in central Syria may not currently possess sufficient resources to decisively overcome the Assad regime’s military advantages. Nonetheless, by threatening key regime terrain such as the Palmyra Military Airbase, the supply routes to Aleppo and Deir ez-Zour cities, and the natural gas infrastructure which provides much of Syria’s electricity, ISIS may achieve asymmetric effects against the regime. This could include forcing the regime to redeploy additional reinforcements to the region, creating opportunities for ISIS expansion into the Syrian central corridor. ISIS cells in western Syria continue to infiltrate and subvert opposition-held terrain. ISIS persists in its effort to expand into rebel-held areas of Qalamoun and the southern and eastern countryside of Damascus, increasingly challenging rebel control of terrain and the unity of rebel ranks. This is likely in order to secure lines of communication that connect ISIS forces in the eastern Homs countryside to ISIS forces positioned along the Lebanese border and inside Damascus city. ISIS militants operating out of the Hajar al-Aswad neighborhood of southern Damascus are accused of conducting an escalating campaign of kidnappings and attempted assassinations of prominent opposition figures in the southern and eastern suburbs of the city in early March. This campaign is targeted to generate local disorder and rebel disunity that can create exploitable opportunities for ISIS expansion. ISIS has also worked to strengthen its direct governance in southern Damascus through public executions, including the March 20 beheadings of three men accused of colluding with the regime. However, ISIS expansion into Damascus Province is met with active hostility from JN, Jaysh al-Islam, and other opposition factions which will be difficult to overcome without additional investment of resources or manpower by ISIS in the near term. A stagnated front line persists between ISIS and rebel forces supported by JN north of Aleppo city. ISIS appears engaged in an effort to disrupt security in rebel and Kurdish-held areas of western Aleppo in order to create an opportunity for ISIS to advance. The objective of the stalled ISIS military offensive north of Aleppo city appears to be to seize control of the rebel supply line passing from the Bab al-Salama border crossing into the former ISIS stronghold of Azaz. 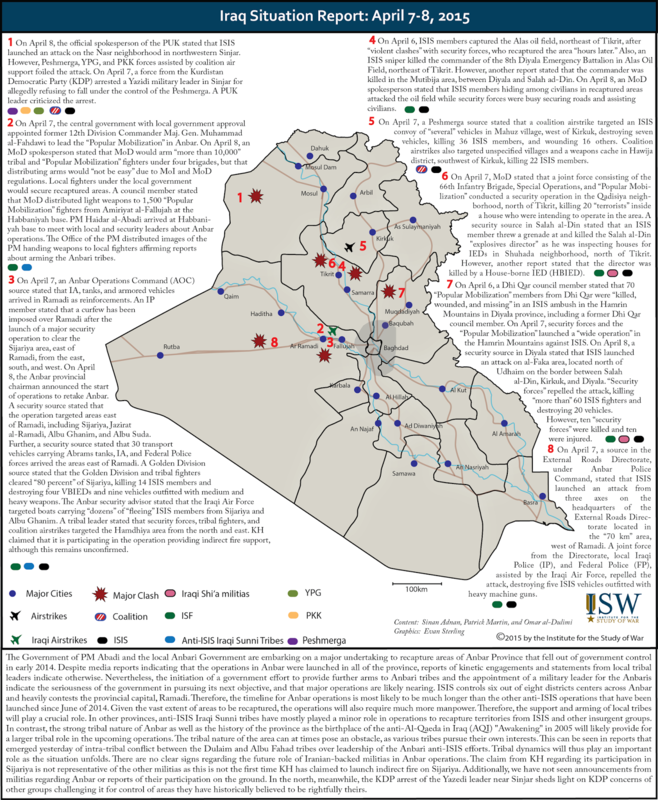 Throughout March, ISIS demonstrated the ability to penetrate into Kurdish and rebel-held terrain through sleeper cell activity. Both the YPG and Ahrar al-Sham claimed to have arrested ISIS sleeper cells. An SVEST attack on March 25 targeting a rebel checkpoint west of Aleppo city appeared to further validate fears of ISIS infiltration into rebel terrain. 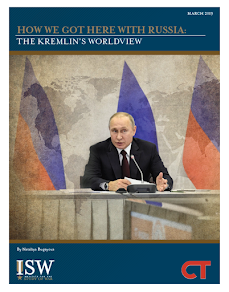 ISIS complements these efforts through a propaganda campaign that attempts to justify ISIS aggression toward certain rebel groups under the guise of combating Western influence and secularism. ISIS has also increased its defensive fortifications north of Aleppo city, possibly in response to a recent increase in JN and rebel tactical victories against the regime in the area. ISIS forces are reportedly digging a network of trenches near Dabiq, building concrete rooms to protect ISIS forces from anti-ISIS coalition airstrikes, and ordering the evacuation of civilians, likely to enable increased fortification in the area. ISIS is likely to continue these two lines of effort in Aleppo in the near term rather than launching a direct offensive against JN and rebel forces.